Our meeting this month will be hosted by Steve Meister. We’ll be getting together from 3 pm until whenever people leave. Directions are in the forum. We’re going to have a Jawa Swap Meet, so clean out those closets and dig out the plastic bins. This has always been a good time in the past, and there will be plenty of bargains to be had. Looking forward to seeing you all there! Utinni! 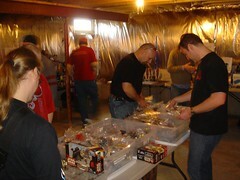 This month we all gathered at Dale Myers house for some Star Wars fun! Check out the pics. Previous post North December Holiday Party Photos Are Up!